Well where did last year go? Not exactly action packed in terms of gaming but lots going on to interfere with it! Practical parenting on full time basis (of 16yr old daughter), new dog, very busy at work and a growing list of health problems seem to have done a good job of getting in the way of gaming although I've still been painting, albeit slowly at times. I daren't do an accurate tally as it'll finish me off but a rough estimate would suggest that I have managed to finish 5 new battalions of Russians for my SYW army, (36 each), as well as completing both sides for my 28mm AWI armies which must run to about 1200 figures now. Far too many but lots of variety. 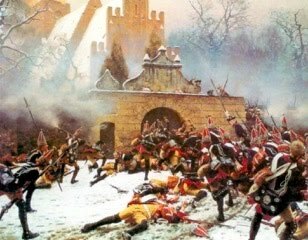 Now before I reach for the calculator to add up the damage I must remind myself that I sold all of my painted 6mm 1866 and Franco Prussian armies this year. I had quite a lot - both sides for Konigratz at regimental level is quite a few figures! Most of them now live in Belgium or Italy under new owners. Anyway, it was a quiet Christmas as said daughter was revising for exams so I thought I'd set up a game and play it solo over the holidays. I recently picked up a book covering the Rhode Island campaign which gives a fairly detailed account of the lead up to the battle and the battle itself. This, coupled with the information contained in one of the BG scenario books suggested that it would make an interesting solo game. Basically, the Rebels were holding a line of redoubts and earthworks covering the withdrawal off the island of their army. The British were trying to trap them against the sea before they could get away. I used Black Powder for this game as I prefer them to other rule sets and I thought the command dice element would be helpful playing solo. The British had two brigades advancing up each of the main roads leading towards the Rebel positions. The one on the right was British and the one on the left mainly Hessians (actually Ansbachers in truth). There were some additional reinforcements as well as some offshore naval gunnery support. The rebels had three quite large brigades of reasonable quality troops - although there were some militia present as well who in the end let the side down somewhat. They also had plenty of artillery, mostly emplaced. Turn 1 saw the British brigade fail its command roll so it didn't even get on the table. 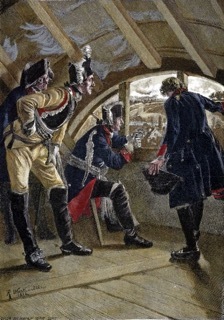 The Hessians did make an appearence and confidently deployed in front of the rebels before pushing forward steadily. 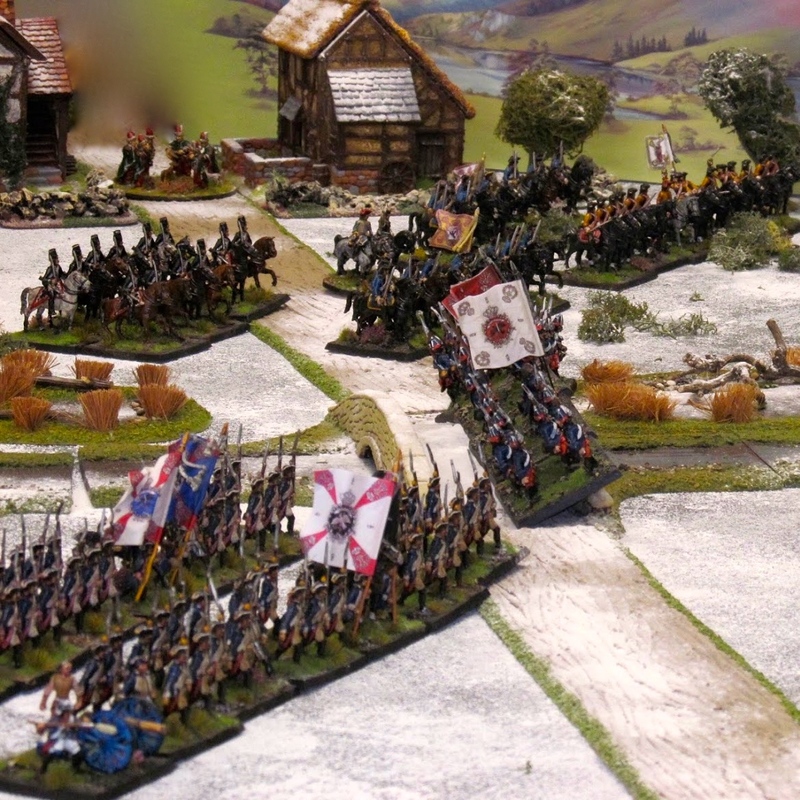 The rebel command dice were equally poor and only the brigade facing the Hessians was able to move, and it withdrew to try and tidy up the line before the exposed units were destroyed piecemeal. Turn 2 and still no British! The Hessians' shooting was pretty good and they drove off two rebel battalions but they in turn were halted by rebel artillery. The rebels facing them withdrew a bit more behind some walls and those over on the other flank failed their roll again. Turn 3 and finally the British arrived, making up for their tardy arrival by getting a low dice score and 2 x moves! They deployed into line but as I was using the ammendment where you can only fire if you move once in a turn they were unable to engage the rebels, who in their turn caused some damage and disordered one battalion. 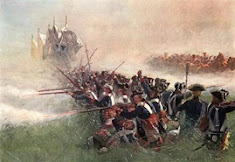 On the left the Hessians were winning the firefight against the rebels and a militia battalion routed. Turn 4 and I thought that the two regular British battalions might be best used in a bayonet charge. I'd given them ferocious charge but as they'd not had a chance to soften the rebels up I held back for a move and tried to shoot a few lumps off the enemy first. Well, even with first fire and being a large unit neither unit was able to do any serious damage to their targets as the dastardly rebels managed to save nearly all of the hits! On the left the Hessians were winning the firefight and the Royal Navy offshore support took out another rebel unit. This meant that both rebel brigades were close to break point. The rebels failed all their command rolls so just had to stand there and take their punishment. Turn 5 and the British bayonet charge went in. They survived closing fire but failed to win the melee and in both cases bounced back out again! Not good, although one rebel unit was destroyed elsewhere on that flank by the combined effects of the British lights and a 6pdr enfilading their line. The rebels were unable to exploit the British withdrawal so that was that. Turn 6 saw the now reinforced Hessians drive off more rebels and this resulted in the two brigades facing them being broken. As there were only three rebel brigades this meant that the game was over. 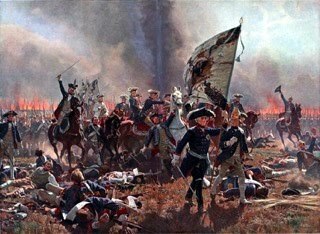 Had the Hessians not performed so well the rebels would certainly have won. 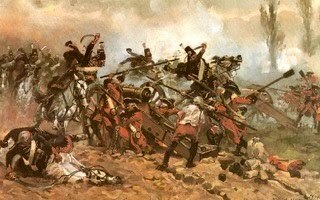 The British had a very bad day, although their brigadier was rated poor so no wonder they didn't really get moving. Verdict - an interesting game and probably more so than I can translate into words. I got my Hessians onto the table for the first time and quite enjoyed the time spent away from Christmas TV and the dog! Hopefully, 2012 will be a better one for wargaming. That is certainly one of my new year resolutions. Another is to actually try and finish the last of my SYW Russians! Great report and pics, Colin. Happy new year to you.